A 21st-century biochemist puts meat on the bones of Charles Darwin’s 150-year-old discoveries. Biologist James E. Haber joins the elites as he becomes the 10th living Brandeis professor elected to the National Academy of Sciences. What Do Our Brains Have to Do With it? Jessica Hutcheson ’11 and Phillip Braunstein ’12 wanted to be working scientists when they grew up. 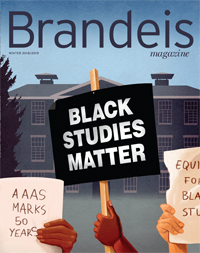 Thanks to a foundation’s generosity and Brandeis’ inclusion of undergrads in its cutting-edge research, they didn’t have to wait that long. Professor Irv Epstein pens a tribute to the first chair of Brandeis’ School of Science, who died on April 24 at age 93. Irv Epstein, dubbed the “million dollar professor” in 2006 when he got a seven-figure grant to launch the university’s Science Posse program, garners another $600,000 to help nurture minority science students, and he knows just how to spend it.